Golden Shellback Splashproof Coatings Now Available | OhGizmo! We wrote about the Golden Shellback splashproof coating back in July, and it looks like the coating is now available for a few select gadgets. 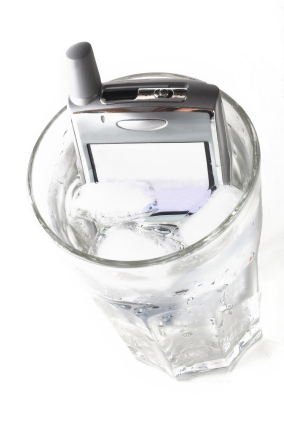 Although the coating is technically splashproofing, not waterproofing, demos have shown that things like cell phones are able to operate quite happily even while completely submerged in water. The awesome part is that you can’t tell that your gadget now has superpowers… It looks, feels, and operates exactly the same, until you find yourself sneezed on by a manatee (or something) and you realize that hey, your phone still works. Golden Shellback coating produces a vacuum deposited film that is nonflammable, has low toxicity and has the ability to weatherproof electronic devices and other surfaces. The clear, nearly non-detectable, uniform film is insoluble in solvents. When applied to clean, moisture free surfaces, such as plastic, copper, aluminum, metal, ceramic, steel, tin or glass, the coating is transparent with excellent weather proofing and anti-corrosion properties. They can do a couple other things too, and my guess is that they’re just slowly testing electronics to make sure that they remain fully functional after the coating process. This is good, ’cause I’m totally hoping to Golden Shellback my dive computer. I first saw this product over at gCaptain.com a few months back. gCaptain.com are the guys working on the launch of the product — Kickass stuff!!!! 4 Times my wife dropped her treo 650 in water and 3 times I was able to fix it from stone dead to working fine simply by submerging it in a large bowl of alcohol, removing it, drying it in a towel, and lightly heating it with a hair dryer. this has worked for my instinct as well, as several other phones I have owned in the past. Now when my phones get submerged, I don't panic, Just remove the battery (My wife does not) soak the phone in isopropyl alky, and dry lightly with hair dryer.. works every ti,e. Great splashproof coatings they are.